Mark Y. asks: Why were people who made alcohol during prohibition called bootleggers? Although Prohibition officially began on January 16, 1920, the impetus for banning the production, sale, importation and transportation (though not the consumption) of alcohol had been brewing for decades before. Part of a string of reforms introduced by Progressives, Protestants and other activists to cure all of society’s ills, limiting the consumption of alcohol was thought by many to be the cure for domestic violence, poor health, loose morals and, of course, public drunkenness. Not just a 20th century phenomenon, many localities and states had been prohibiting the sale of liquor long before, including a ban in Maine from 1851 to 1856, and in Kansas, which banned the sale of alcohol in 1881 and didn’t repeal it for hard liquor until 1948. To get around this problem, some took to keeping a flask discreetly on their persons, and one convenient place was in the top part of a tall boot, which had been used since time immemorial as a place to stash all kinds of contraband (think knives and guns). The “leg of a tall boot,” has been called a boot-leg since the 17th century, and the term was commonly in use during the mid-1800s. The saloon in Kansas has gone and gone forever; we know that we are better off in every way, morally, financially, and religiously. ‘Tis true liquor is brought in from Kansas City and other points in Missouri, and it is used slyly. Sometimes men sell it on the sly. This business is called ‘bootlegging.’ At our last term of the District Court one man was convicted for selling in this way, and he was fined $100 and given a jail sentence of thirty days. 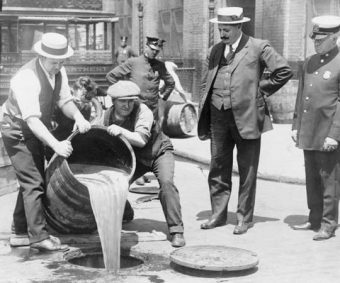 The term “bootlegging” saw a huge surge in popularity once Prohibition spread nation-wide in the United States with the 18th Amendment taking effect in early 1920. 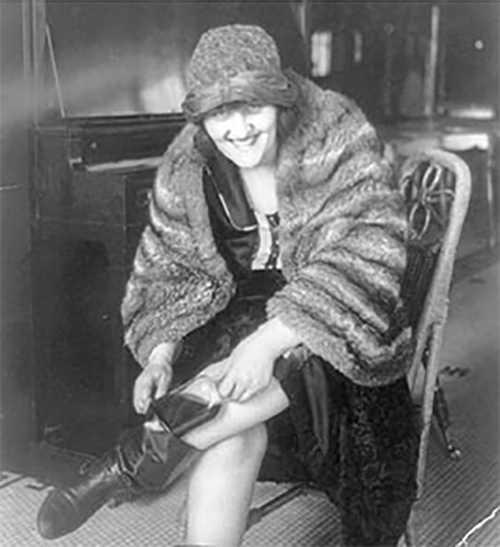 Soon after, the term was generalized to no longer just reference things related to illegal alcohol, but all manner of items, even “bootleg babies” (Daily Express March 5, 1929), referring to a smuggled baby. The following year Variety noted in an article published on April 10, “There is almost as big a market for bootleg disk records as there is for bootlegged books.” This general sense of the term has popularly endured to today. Back to Prohibition- an interesting period in American history, the push and pull between the purveyors of alcohol (who ranged from small-time moonshiners to gangsters like Al Capone), really came into its own in the 1920s after the passing of the Volstead Act. Providing for a police force of federal agents, the Bureau of Internal Revenue (which eventually became the Bureau of Prohibition) desperately worked against the bootleggers to keep the country sober. In order to get their product around the Revenue forces (sometimes called revenue agents or revenuers) to their parched consumers, illegal producers and distributors tried a number of tactics, including “suping” up their cars’ engines and strengthening their suspensions to be able to outrun the federal agents. Although the Bureau had annual budgets in excess of $10 million (about $140 million today) during Prohibition, the revenuers apparently faced a battle they simply could not win, and alcohol consumption (the reduction of consumption of which was the stated purpose of Prohibition) actually went up 39% from 1919 to 1929. Moreover, while prior to the ban Americans split their consumption about 50-50 between less potent beer and stronger liquors (e.g. whiskey), during Prohibition, as beer was difficult to produce and transport discretely, relatively little was made and many drank strong spirits and fortified wines instead. In addition to the massive switch to harder liquors, some of this “bathtub gin” was further strengthened with “dangerous adulterants,” that occasionally proved deadly; and, in fact, between 1920 and 1925, the number of deaths each year from tainted liquor quadrupled to 4,154. Essentially, some felt that the people who were drinking the illegal alcohol got what they deserved and some found it to be a net benefit that these individuals were dying off, helping to remove those who drank from society. On that note, conspiracy theorists even posited the poisoning program was a national experiment on exterminating members of society that the government felt were undesirable as American citizens, noting that it was really only the poor who were affected by this tainted alcohol supply program. Besides the deaths of thousands as a result of tainted alcohol, rampant illegal bootlegging, and a rapid rise in per capita alcohol consumption, criminal activity during Prohibition also increased in the general case, with thefts and burglaries increasing by 9%, and homicides and assaults by 13%. 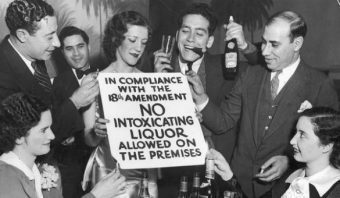 Whether having anything to do with Prohibition or not, this was all making it readily apparent that banning alcohol wasn’t having the intended positive affect on society, nor stopping people from drinking. Ironically, public drunkenness and disorderly conduct arrests increased by 41%, and arrests for drunk driving increased by 81%. Finally, on December 5, 1933, Prohibition officially ended when Utah became the 36th state to ratify the 21st Amendment, originally proposed by Congress on February 20, 1933. Once ratified, this constitutional amendment repealed the 18th Amendment. When President Roosevelt signed the Cullen-Harrison Act, which amended the Volstead Act to allow the manufacturing and sale of certain kinds of alcohol, he made the now famous remark, “I think this would be a good time for a beer.” One day later, Anheuser-Busch, Inc, sent a case of Budweiser to the White House as a gift to the President. The word “prohibition” comes from the Latin “prohibitionem”, meaning “hindering or forbidding”. It was used to mean “forced alcohol abstinence” as early as 1851. “Suping” up their engines? You sure about that? I’ve never seen it written as anything other than “souping” up an engine. ‘Splain please.